You, as a stock trader, will want to identify shares in an uptrend to find a possible candidate for a long trade. It is absolutely critical to understand that there are different market trend situation. Good and profitable trader / active investor do not use only one trading strategy (like buy pullback for any stocks). Such strategy works well in bull market but fails in bear market or in sideways market. So when you find that general market is in bull trend, then it is much easier to trade shares which are also presenting itself with rising price. Corrections (pullbacks) are not as strong as rising moves. 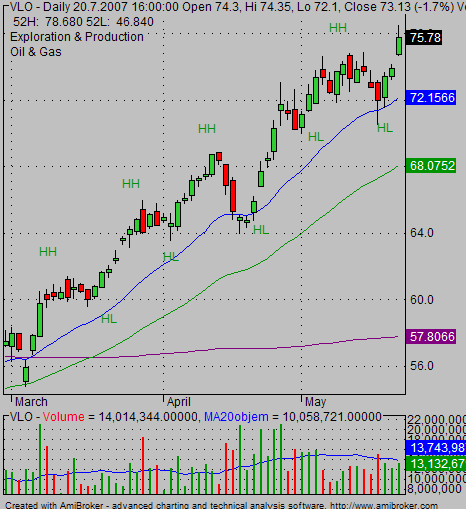 There are higher highs (HH) and higher lows (HL) on the chart. Volume during rising periods is higher than during corrections. As you can see, moving averages can help you visually identify an uptrend during your trend analysis. Do you see that price is above all important moving averages and 20EMA is above 50EMA? Both these pieces of info are available on this chart and provide you additional hints for easier reading of any chart. There are several options how to trade rising prices. First you have to identify what is prevailing global market trend. Are we in bull market environment or in bear market? If you are in a bull market then it is safe to trade bullish stock picks for a long trade. You can use bullish swing trading strategies. If we are in sideways market then you can trade both directions, i.e. bullish trades and bearish trades. But you have to find and select stocks presenting biggest relative strength for bullish trade. Finally in a bear market you should prefer to trade bearish stock trading strategies. If you want to buy something then you should be certain that such stock has the biggest relative strength you can find. You should also apply conservative money management rules for these trades. 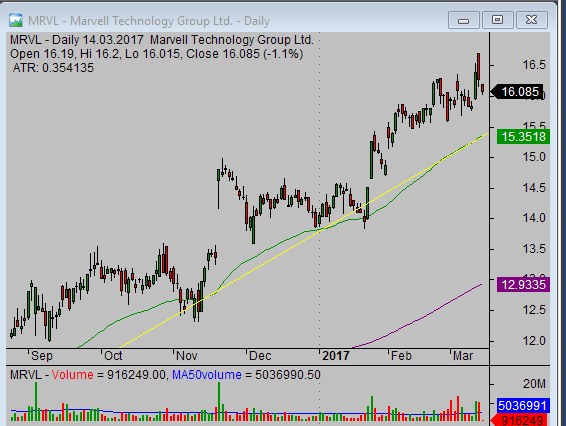 As you can see on the MRVL chart example, the only possible strategy was to use bullish strategies during this uptrend.